My girlfriend suggested we cycle from her brother's house to her mom's. Of course, her brother lived in Switzerland, and her mom in Austria, and there were a few mountains in between. I immediately jumped at the chance. Little did we realize that it would be the hottest summer in the Dolomites in 250 years. It was swelteringly hot, but we persevered, and had a great trip through some amazing scenery. The canyon of the Tarn is one of the obvious highlights of the Cévennes National Park. Another landmark landscape phenomenon are the so called 'Causses'. Causses are the bleak and barren high limestone plateaus of the Cévennes National Park. This site deals about a short but fascinating cycle trip that Willem Hoffmans and I undertook through the gorges, plateaus and volcano landscapes of the Massif Central. Cycling in the autumn means there are gew facilities but also few tourists, which gave us a whole new perspective of life in the French countryside. After the long German winter, we are impatient to get started with the cycling season. Looking for a land of early spring sunshine and mild temperatures, we decide on Apulia, southern Italy, the heel of the boot. Apulia is more than just sunshine. There are many small roads with little traffic, beautiful beaches and an excellent cuisine. Those interested in history and art won't be disappointed: with Palaeolithic finds, Greek vases, Romanesque churches, Norman fortresses and Baroque cities there is much to see. We toured two weeks, 750 km and stayed in hotels or pensions. We are now in Cambodia, after 10 months of cycling thru New Zealand, Australia, Malaysia, Thailand. Our site is bilingual. Our web site is about the trip that we are now realizing. We have gone across the world to go back to Canada. We already crossed 5 different countries in 10 months. We will keep biking for around 2 more years. The subject treated by the web page is mostly about our trip (story, pictures, organisation) but we added a lot of other stuff like recipes, rock climbing, and small articles. We are French-Canadian, so our web site is belingual. I decide to leave Switzerland and cycle until Tibet. The road decide for me and I finally arrive one and an half year later in Cape Town, South Africa. This is a journey dedicated to freedom, people and nature. This tour may continue to South America but I'm still working as a tour guide in Namibia to get money for the next destinations. Have a look on my cold stage in Turkey, nice time in Syria, amazing Sudanese crossing, wild Tanzanian experience, pure Namibia, etc... I hope you will enjoy and feel free to contact me. A historical look at Alpe d'Huez plus written and photo reports from the Marmotte and Etape du Tour events. Both events finished at the top of Alpe d'Huez this past July. 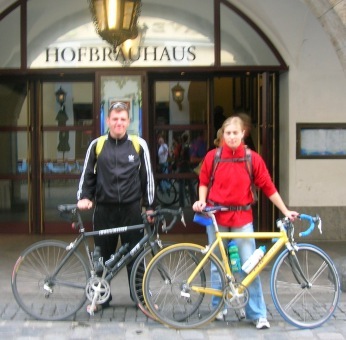 In the summer of 2004 we cycled 2250 kilometer from Holland to Rome. During the trip we passed through 10 countries and cycled through the Ardennes, Vosges, Alps, Apennines and Tuscany. We enjoyed the beautiful italian villages and met a lot of other cyclists. A lot of pictures, tips and travel stories in Dutch (English translations will soon appear). In 2004 fietsten we van Nederland naar Rome. We fietsten door 10 landen en door/over de Ardennen, Vogezen, Alpen, Appenijnen en Toscane. We genoten volop van de mooie Italiaanse stadjes en ontmoetten heel veel andere fietsers. Veel plezier! During July and August 2005 we cycled through amazing Norway. Mountains, glaciers, fjords, forests, carribean-style beaches (with cold water :( ...), space and stillness. We cycled from the North Cape down to Oslo via the Lofoten, RV 17 Coastal Route, Trollstigen, Geiranger, RV 55 and Rallarvegen. A lot of pictures, tips and travel stories in Dutch (English translations will soon appear). In juli en augustus 2005 fietsten we door fantastisch Noorwegen. Bergen, gletsjers, fjorden, bossen, bounty-eiland-strandje (met veel te koud water :( ...), rust en ruimte. We fietsten van de Noordkaap naar Oslo via de Lofoten, RV 17 Kustroute, Trollstigen, Geiranger, RV 55 en Rallervegen. Veel plezier! From the beginning of the Italian Alps to Munich, and way back to Venice. A self-organised, seven-day tour for four through the countryside of Eastern Slovenia and Western Hungary. A total of 647km travelled. Highlights included: romantic Ljubljana, the socialist-realist new town of Velenje, traversing the Pohorje Massif via the Rogla ski resort, crossing the border at Kobilje, sampling erratic Hungarian driving techniques, having to off-road frequently, 85km of flat along Lake Balaton, the old town of Szekesfehervar (when we found it), and entering Budapest the hard way via the Buda hills. In March of 2006 we set out to cycle from the UK to Tibet. We didn't quite make it but had a great adventure cycling across Europe in one of the wettest winters on record and then through the wilds of Central Asia. The site includes lots of images from Tajikistan one of the really countries for cycling. In the summer of 2006 I have cycled from Stavanger in Southern Norway to the Nordkapp. It took me 3.260 kilometer along fjords, across islands and over highlands. These pages put together stories, pictures, maps and information about the cycling trip. Siamo partiti il 16 luglio 2006 da Magdeburg. Abbiamo costeggiato l'Elbe, intersecando la Romanik Strasse, sino ad Amburgo. Lungo la riva sinistra dell'Elbe abbiamo raggiunto Cuxhaven sul Mare del Nord. Da qui con una motonave che salpa due volte alla settimana siamo sbarcati a Brunsbuttel, sulla riva destra dell'estuario dell'Elbe e, attraverso l'alzaia del Nordsee-Ostsee Kanal, abbiamo guadagnato Kiel, sul Mar Baltico, dopo 830 km, il 26 luglio. 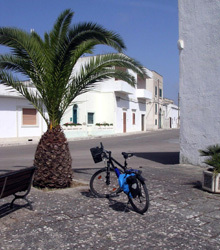 Bike Tours: Travelogues, photos, maps and tips about long distance bike traveling in Greece, Turkey, Italy, Switzerland, Germany, Slovenia, France, Spain; Mexico, Canada; South America and others. Reiseberichte und Reisefotografie von Radtouren in Europa (Italien, Griechenland, Spanien, Mallorca, Frankreich, Tschechien, Slovenien etc. ), Kanada, Mexiko, Südamerika und viele mehr. Lass dich inspirieren! These pages describe a week long cycle tour through Central Tuscany in May 2006. The route took me from Siena to Florence via Castelnuovo Berardenga, Vagliagli, Radda, Gaiole, Panzano, Montefioralle, Greve, San Polo, Strada, and Impruneta. In questa sezione del sito personale di Paolo Adamoli vengono descritti alcuni viaggi in bicicletta dal 1998 al 2006. Oltre a itinerari classici come il Danubio da Ulm a Bratislava, è interessante l'ultimo viaggio, nel luglio 2006, da Magdeburgo al mare del Nord e lungo il Nordsee-Ostsee-Kanal sino a Kiel, sul mar Blatico. Bicycle world tour part II from Mun Suk and Eric Wehrheim. Actual tour in South and maybe Central America. Open end. On the homepage you will find also some information and fotos from our bicycle-world-tour part I who was from Germany to South Corea by crossing Africa. If the link to our homepage doesn´t work well (sometimes in South America this happend to me) please go to http://aventurero.cjb.cc. It´s the same page only on another server. Solo biking trip still in progress from a 31 year old woman ex-software engineer. Started April 8th, 2006 in Lisbon, headed East towards Istanbul. Currently in Dresden, Germany, over 5000 kms pedalled so far, across most of continental Europe. Descriptions of our one to four week tandem tours at a leisurely pace following river valleys where possible and always via the most minor roads. 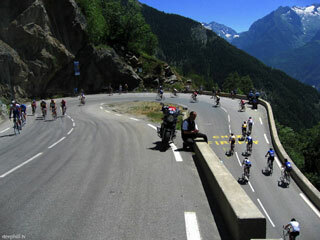 This bike trip in France, from Metz to Nice in July 2006, was our annual club event. The Lafayette Riders (Cavaliers) started in the Alsace-Lorraine region of France, where a cardiologist noted the poor condition of the miners and determined to do something about it. Bicycles seemed the answer. Eventually, the mining group encountered American riders and it was decided to form a group with the Marquis de Lafayette being the symbol of enduring Franco-American friendship. The Lafayette Riders alternate between France and the United States each year, and next year (2007) the club will get together in northern California. 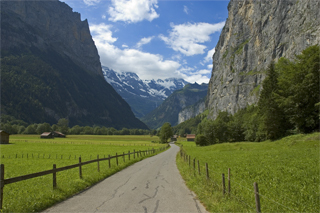 Nancy and Ron take a leisurely 28 day tour through parts of Switzerland, starting and ending in Zurich. Ron took more than 3,000 high quality photos and over 200 are included in this journal. Un tour par les petites routes et par des cols ni très hauts ni très connus pour arriver sur une montagne vraiment unique. Taking small roads and riding over passes neither very high nor well known to climb to a really unique mountain. Kleine Strassen und wenig bekannte, nicht so hohe Pässe, die zum einem einzigartigen Berg führen. Cycling from St Jean Pied Du Port to Santiago de Compostella. Slowly. Cycling from Luni to Rome on the mediaeval pilgrimage road, the Via Francigena. We turned off the road onto a very steep up and down track which took us through the forest and past a large dam. At first the path had a concrete surface and the water was running down it in a continuous stream. After we had passed the dam, the track deteriorated into soft sand and was unrideable for much of the way. Eventually, we struggled into Velesin. There was plenty of evidence that they had been hit by a heavy storm and many people were busy pumping water from their flooded basements. That night we saw on television that the area just south of here had suffered flash flooding, trees blown down and major power cuts as a result of the storm. Luckily, we seem to have been skirting the edge of the storm for most of the day and missed most of the rain and winds. It rained every day of our tour but only for a short period at a time, so we had plenty of time to enjoy the beauty of the country and the attractive towns and cities. The Donauradweg is one of the most popular cycle touring routes in Europe. Thousands of people ride on the bike paths along the Danube each year. Even grandparents and young school children do it. So popular is the Austrian section of the route that during the summer holiday period, Austrian railways run special bicycle trains to carry people to and from the start and end of their ride. So why would we want to join the crowds and cycle from Donaueschingen to Vienna? The answer is simple. This is one of the most pleasant and enjoyable cycle rides anywhere. Picturesque old towns and villages, dramatic castles dominating the skyline, spectacular gorges, delightful forests and a beautiful river. All of these combine to make this a cycle tour to remember. We had been cycling for over two months when we arrived in the village of Svogerslev near Roskilde to visit friends. We were ready for a break from our daily routine of breaking camp, loading the bikes, riding to the next night's destination and then pitching the tent again. A few days in an attractive old house with views over the gently rolling countryside were just what we needed. We felt refreshed and ready to hit the road again. With its numerous marked cycling routes and relatively gentle terrain, Denmark is an ideal place for a easy cycle holiday and the islands of Fyn and Sjælland are quite delightful. I stopped a few metres before an intersection and was busy peering at the map when I became aware of a number of cars stopped beside me with their indicators flashing. Six cars were patiently waiting for me to proceed so that they could give way to me at the intersection. I made certain that in future I stopped well away from intersections when I wanted to check my map. Danish motorists are extremely courteous towards cyclists. They do have a legal obligation to give way to cyclists and pedestrians at intersections, but it is much more deeply ingrained than that. It is something that is taught to every Dane from an early age. With its numerous marked cycling routes and relatively gentle terrain, Denmark is an ideal place for a easy cycle holiday. We left St. Moritz and dropped down the gorge to Celerina. From there we rode through lush green meadows and on smooth paths by the river. It was Saturday and there were lots of people out on their bikes enjoying the warm, sunny weather. Everywhere, there were 'Chocolate Box' views of snow covered mountains, picturesque villages with cows grazing in the wildflower strewn meadows. With the source of the river at approximately 1,800 above sea level and its mouth at Passau only 313 metres, it was reasonable to assume that this ride was going to be down hill. Well, more downhill than uphill. When we reached the village of Zuoz, the track climbed steeply into the forests and became considerably rougher. It climbed steeply up and down as we bypassed narrow rugged gorges. There were numerous patches of loose stones and soft sand where winter damage hadn't been repaired. In sheltered corners there were patches of ice and snow. At the highest point of the climb, a path had been cut through a two metre high snow drift which covered the track for about twenty metres. Freda White in her classic travel book on this region said that a visitor to this region of South West France would cry 'Now I know why they say ``la belle France''!. It is truly one of the best parts of France with beautiful rivers, rugged cliffs and gorges, spectacular cliff top castles and more than its fair share of the ``plus beaux villages'' (prettiest villages). It is a region that has been popular with tourists for years and during the peak holiday season from mid July to mid August, the roads, hotels and campgrounds are packed with holiday makers. Avoid this time of the year and you will have quiet roads to pedal along and a wide choice of accommodation. This is truly one of Europe's best cycling regions. We had eaten breakfast on board the ferry from Portsmouth, but shortly after setting up our tents in the campground in the old citadel at St. Malo, Alan and David walked down to the town to look for a boulangerie to buy bread for another breakfast. They had seen people walking about with fresh baguettes, but after wandering around for some time, they hadn't found the boulangerie. They stopped on a street corner thinking that there had to be one somewhere. They turned around and found that they were actually standing in the doorway of the boulangerie blocking the entrance. Armed with several baguettes, croissants and confiture, they started on their way back to the campground, only to be waylaid by the aroma of freshly brewed coffee from a waterfront café. Eventually they returned to the other members of the group who quickly devoured everything. This pre-occupation with food was to set the tone for this tour through Brittany and Normandy. We caught the ferry from Newhaven in southern England to the French port of Dieppe from where we planned on cycling through Normandy. Because of bad weather, the ferry was diverted to Boulogne, 120 kilometres further north. Well that was the official reason given by the captain after we had left Newhaven. One of the crew told us that the real reason was that work on the ferry terminal in Dieppe hadn't been completed so the large hydrofoil ferries which had only started operating the route couldn't berth properly. Most of the people on board were taking advantage of the cheap fares to have a day shopping in France and provided there was a hypermarché nearby, they weren't worried where they ended up. For us on our bicycles, it meant a rethink of our plans. A trip from Crete (Greece) to Holland. We fietsen vanaf Heraklion een rondje Kreta. Vanaf hier varen we naar de peloponissos, waar we richting Patras fietsen. We gaan naar Italie waar we richting Sicilië fietsen. Via Sardinië en het prachtige Corsica, varen we naar Touloun. Als afsluiter nemen we een paar hoge alpen passen zoals de Galibier. Na 3000 km en 2 maanden nemen we het laastje stukje de trein naar Huis. A five week tour from the Hungary/Ukraine border from Uzhgorod, Ukraine to Samara, Russia. Two American cycle tourists who speak some Russian travel across much of Ukraine and southern part of European Russia. 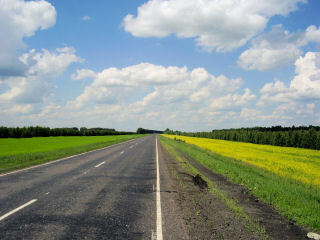 This was a mostly self-supported trip where we stayed in hotels, but also some visits with friends in Russia. I do not believe my eyes. Before us lies a wide, completely flat valley. A late evening sun shines over the valley below. The 2.400 meter high Monti Sibillini rise majestically out of the plains. This is one of the most beautiful valleys I have ever seen. Willem Hoffmans and I set out from our homes in Holland for a journey to Italy. Through the Vosges, the Jura and across a lot of cols in the French Alps we reach the Italian border. 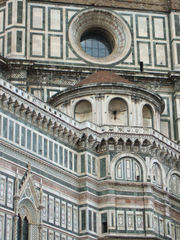 In Italy we make a lot of detours through Liguria, Tuscany, Umbria and Lazio. This tour around Iceland was in August 2005. The idea was to cycle the entire route 1 and not to use public transport. Also to camp every night for free. I suppose it was Iceland on the cheap, and it was total trip cost 425 pounds including everything. Bericht über eine organisierte Tour von Florenz nach Siena.